First Bank, *894# Advert Challenge!!! Are you a Unilag student? Are you Talented, Creative, An Akokite, Young & Vibrant !!! Enter for the 894 advert challenge now. 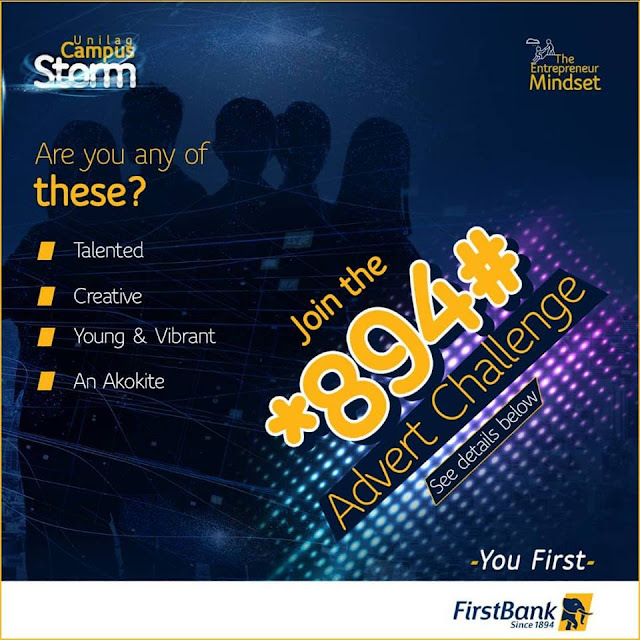 (2) Make a 1 minute 894 advert video, tag @firstbanknigeria and tag 5 friends who should follow us (3) Top 5 videos with the highest likes will get the chance to join the #894Challenge finals at the #UnilagCampusStorm event and win cool cash. Entries Close by 3pm, Thursday, 2nd August.